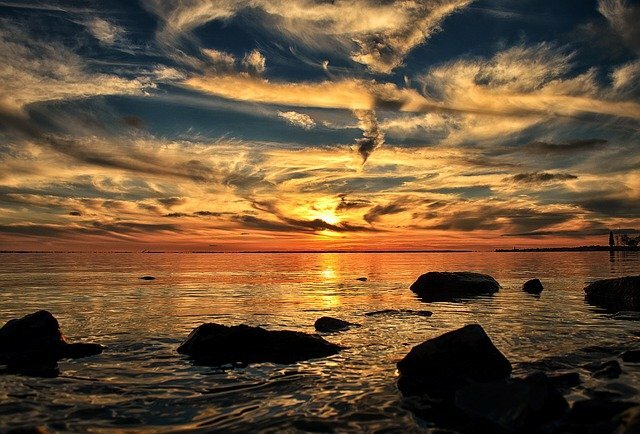 However… finding work and living in some of these amazing places can be difficult. The good news is, work from home jobs in Canada are becoming more common as the trend towards remote workspaces and telecommuting grows. Living, working and enjoying life is possible. Some are "employee" based, meaning they’re not always hiring, and like any job, you'll need to apply, interview, etc. Many of these jobs also come with health benefits and bonuses. Some are not necessarily work at home, but work out of your home. Driving for Uber is one example. Its home based but obviously not work at home. There are few others on this list that require a vehicle. I've also included simple and quick ways to make a few bucks online, like doing surveys with Survey Junkie for example, or watching videos and visiting websites with Swag Bucks. And not to be left out, making money online with your own business is mentioned which has a much higher income potential than the others where you're trading your hours for dollars. Finally, for the most part... I left out specific wages because many depend on the position you're applying for, the province you're in... and the state of the economy. 3D Power - An architectural animation company that creates virtual walkthroughs of buildings, properties, government projects etc. They hire remote photoshop artists, web designers, animators etc. for collaborative projects. Alorica - A home-based customer service company that provided paid training, benefits, and what they claim to be competitive wages (competitive with who they don’t say). When searching you can sort by country. Canadian Mortgages Inc. - If you have a background in finance, Canadian Mortgages periodically has some remote mortgage broker positions. Concentrix - With industries ranging from automotive to banking and healthcare, Concentrix has a wide variety of work at home opportunities listed. Both Canadian and US jobs are listed together within the drop down menus, so it might take a little extra searching. ContractWorld - They connect home based workers with customer service positions for companies such as L’Oreal, ClubLink and Pizza Hut. 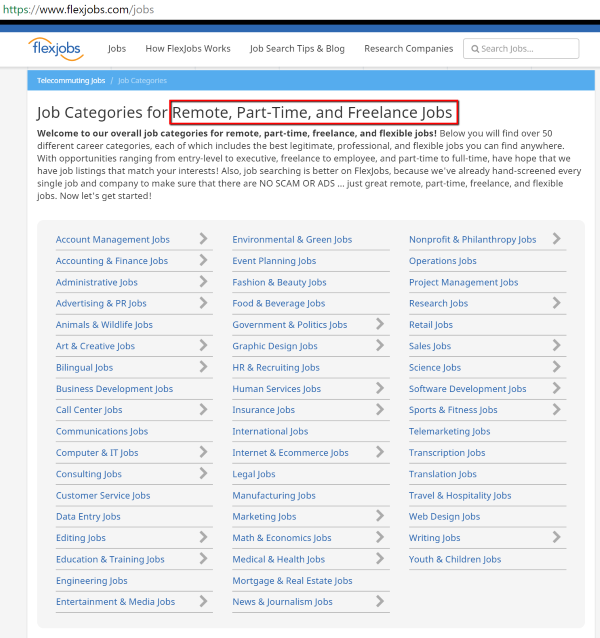 Flexjobs - In addition to remote jobs, you can also find location based part-time jobs here. Many positions require specialized education like business analyst and engineer, but you can also find jobs such as resume writer and inside sales. Examples of the categories they have listings in are below. Global Mentoring Solutions - Work at home employees of Global Mentoring Solutions have the potential to earn (according to their website) close to six-figures with benefits such as medical and dental. These are skilled positions in IT however, so they are not for everyone. Also, many of the Canadian Jobs are mixed in with US jobs (example below) so you may have to sift through some of the listings. HGS - Hinduja Global Solutions (HGS) is an employee based home job where you answer incoming calls. A highschool diploma or equivalent is required with minimum wage pay. Inspire Fundraising Solutions - Work from home employees at Inspire Fundraising Solutions make outbound calls to new, existing and past fundraising supporters. Benefits are included in the compensation. 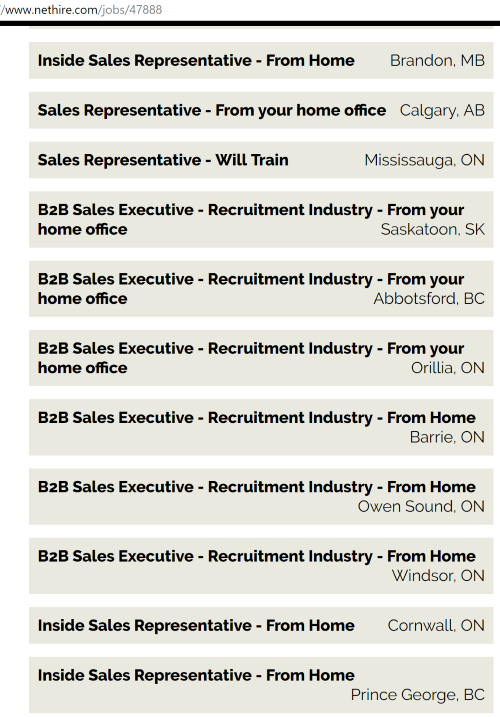 NetHire - Canadian based recruitment agency with most of their in-home work being business to business sales positions (examples below). Pizza Hut - Taking pizza orders from home is a trend that hasn’t gotten real traction yet. While some companies, like Pizza Hut employ at home workers, some others have tried without much success. Pizza Orders at Home (Franchise Owners Hamilton Ltd.) - Another order taking opportunity. Their only client at the moment is Pizza Pizza but for all the benefits of working from home (no commuting costs, living outside of high-cost neighbourhoods…) taking pizza orders is not the worst opportunity out there. 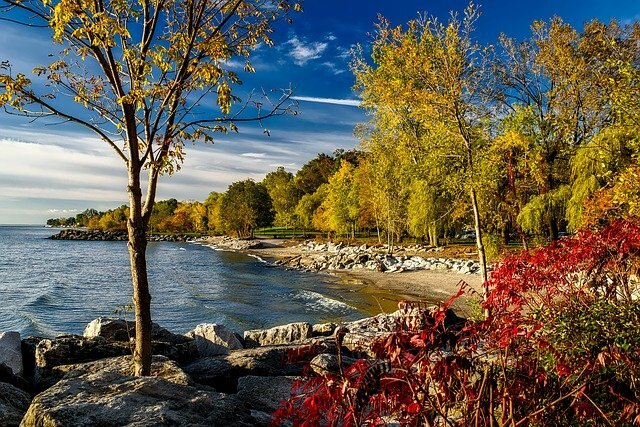 Sykes - A global company with 46,000 employees, Sykes Canada often has home-based customer service jobs that also come with health benefits. Transcom - A global company that hires virtual customer service agents. Like many of the companies on the list, they’re not always in need of people. They might be a good company to bookmark and check with periodically. UHaul - There’s enough UHaul centers across the country that I would never have thought UHaul employed people to work from home, but it turns out they do. 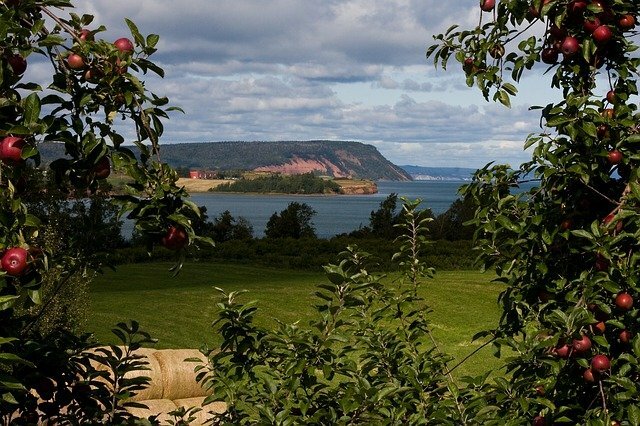 Check out their remote sales and reservations opportunities. It’s a minimum wage job, but according to their website they also provide bonuses and benefits. Unity4 - Vancouver based company that provides virtual call center services. Weed Man Turf Ops - Weed Man is a Canadian born landscaping company that uses virtual sales agents. If you don’t mind making outbound sales calls, this might be a work at home job worth looking into. 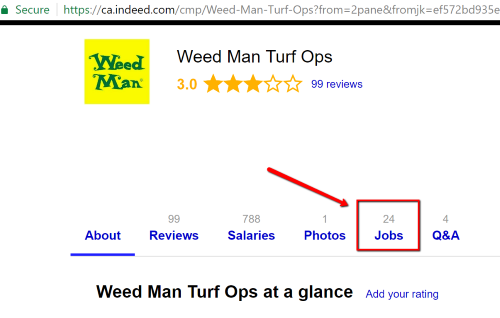 When searching for Weed Man Turf Ops jobs on Indeed (or any job on Indeed), there is place to read company reviews. If you'd like to see all the jobs they offer you can locate those from here (pictured below). There are different types of freelance jobs. Some are company specific, meaning you apply like you would any job, but you're paid as an independent contractor and you make your own schedule. Other types of freelance jobs are marketplace based, where employers (many small businesses and solopreneurs) and freelancers buy and sell services. These are not company specific (unless you get hired on for a long-term project or contract), but usually consist of many smaller jobs for multiple employers. This category of freelancing (jobs) is for those who prefer the flexibility of an independent contractor, but the stability of working for a company. Accutran Global (check out the review) - One of the more common jobs you’ll find online are transcription jobs. They usually per “audio minute” or per word (Accutran pays $.004 - $.0055 per word or $.40 per audio minute for larger projects) so the better you are, the more you can make. It can be a stable income for experienced transcribers. To apply to Accutran Global just scroll down on their homepage and you will see a link. AIETA (American International English Teachers Association) - An online English teaching job where you can earn an annual income 60K or 70K… but you will need to apply with your bachelors degree, and prove your ability to teach. Analysia - This is unique web-based job, although not really a “job”. You can make some extra money by testing websites and giving feedback on your experience. It’s a pocket money side gig though, not a place you can earn a full living. Babbletype - Another transcription company that pays weekly via PayPal. This is a freelance position and like most transcription companies, you must apply and be qualified. They also require native speakers for the language that’s being transcribed. Blue Zebra Appointment Setting - Another business to business cold calling opportunity, Blue Zebra Appointment Setting claims to pay between $15-$25 per hour depending on your experience. Dada ABC - Provides English language classes for children ages 4-16 and hires online english tutors. Golden Voice English - Another English teaching company that tutors Chinese children through video conferencing. Lyft (Currently in Toronto) - Relatively new to Canada, Lyft is a competitor to Uber which is currently available in the Toronto area. Uber - By now Uber has made their impact in Canada. It’s not exactly a “work at home” job… but you are working “from” your home, making your own schedule and not having to go to an office, or specific place of business every day. Mystery Shopping Inc - Since my days pumping gas in the early 90’s, I’ve always wondered about being a mystery shopper. You’ll need a vehicle for this job but it could be a fun side hustle if you have another source of income. Pay ranges between $10 - $15 per store which covers 15 minutes in store, 15 minutes of paperwork, and expenses such as fuel. Panda Tree - A little different than the other language tutoring websites that focus on English, Panda Tree hires Mandarin and Spanish teachers. QKids - If you’ve ever thought of going overseas to teach English… except for the going overseas part, QKids might be what you’re looking for. Here you will teach English online to children ages 5-12, but like many online teaching positions, requirements can be specific. Scribie - If you’re new to transcribing, Scribie is probably the place you want to start. They don’t have the stringent hiring requirements and obligations like some other transcription companies. They also let you pick and choose your jobs rather than waiting around for it to be assigned to you. Travel Masters - If you have experience as a travel agent, Travel Masters might be a good opportunity. They hire both location-based and home-based workers. It is however 100% commission based with no base salary, so the upside can be good… but there’s also a chance of earning nothing. Tutor.com - One of the most popular online tutoring platforms, Tutor.com has positions for tutors in 40 different subjects including math, science, english, business, social studies and test preparations. Becoming a tutor isn’t a given either. They require applicants to be tested and submit to background checks. However… this is a stable work at home job and if you’re qualified one of the better online opportunities. Valnet - Valnet is a digital media publishing company and has some work at home opportunities, such as social media content writers. 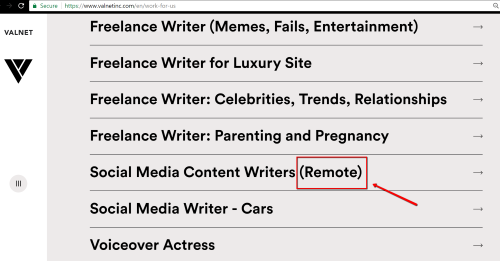 These are remote freelance positions but you still need to apply and send samples of your writing. Virtual Gurus - If the idea of customer service or sales doesn’t appeal to you, Virtual Gurus (VG) hires virtual assistants. VA’s can be hired for a range of services from data entry work or technical tasks to creative jobs such as graphic design. VIPKid (check out the review) - one of the more popular online english teaching platforms. VIPKid provides virtual classroom settings for students in China; specifically children between the ages of 4-12. ClickWorker - A microtask site (pay per task) in areas such as writing, translating, researching, and data processing. The more efficient you can perform tasks the more you will get paid. Content Mart - One of the most sought after positions online is a content writer. There are plenty of people who write, but good ones can be hard to find. If you have a skill for writing, you can definitely find work as an online content writer. Content Mart is always looking for freelance copywriters and editors. Areas of specialty include business, travel, kids/parenting, resumes and entertainment. Domainite - A web design and development company that is also a content provider for their clients. Field Agent - Okay… Field Agent doesn’t really belong in this list of work at home "jobs", but it is a unique money making idea. The concept here is an app based exchange where people post various tasks, like taking a location based picture for example and getting paid for it. You’ll never turn this into a full-time income, but to snag a few extra bucks every month you can keep the app on your phone and see what tasks turn up. Gigwalk - Similar to Field Agent but with more substantial tasks. Gigwalk also won’t provide a reliable income, but having their app on your phone and picking up a gig here and there can provide some additional income. Payments are made through PayPal. HireWriters - HireWriters pay up to $20 per article once you become established (and your work trusted). Other available jobs here are proofreading and researching. italki - italki claims to be the largest online language learning marketplace in the world. They have more than 1.5 million students all over the world and thousands of teachers teaching over 100 languages. Getting started here is easier than most other language tutoring websites. italki is a marketplace, rather than a service provider, so you can simply create your profile and introduction video and then look for students (or have students looking for you). iWriter - You won’t get rich writing for iWriter, but having purchased some articles from here before, with just a little bit of writing talent you can easily be one of their elite or elite plus writers and earn a livable income (depending on where you live). Unlike a freelance site such as Upwork for example, the focus with iWriter is speed. I’ve posted a handful of jobs and had them completed within an hour or two. Skillshare - Skillshare is a wide open tutoring marketplace. You can teach just about anything (well… within reason...) from photography and entrepreneurship to math or music. 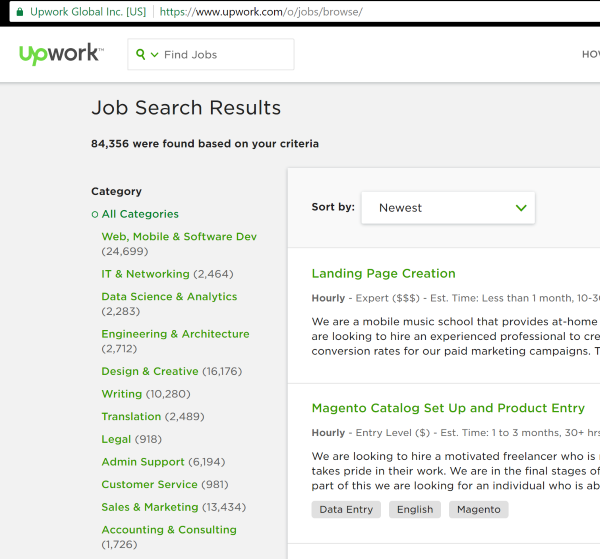 Upwork - one of the most popular and well respected freelance sites online. It’s the go-to place for professional online business owners and large companies searching for talented workers. As an Upwork customer I can say the way they operate as a broker between client and freelancer is exceptional. As a freelancer you can find both long-term hourly jobs and fixed price projects. Fiverr - Similar to Upwork and just as popular. Fiverr has a somewhat different reputation, often seen as a cheap way to get something done. But the truth is, most freelancers will post jobs on multiple freelance sites and the quality (and price) of the work is dependent on the freelancer, not necessarily the website. If freelancing appeals to you, Fiverr is definitely one you’ll want to set up a profile with. Peopleperhour - Works much like Upwork and Fiverr, but not as well known. 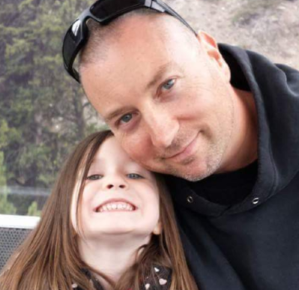 Wealthy Affiliate (check out the review) - For something different, this Canadian based company might be what you’re looking for. 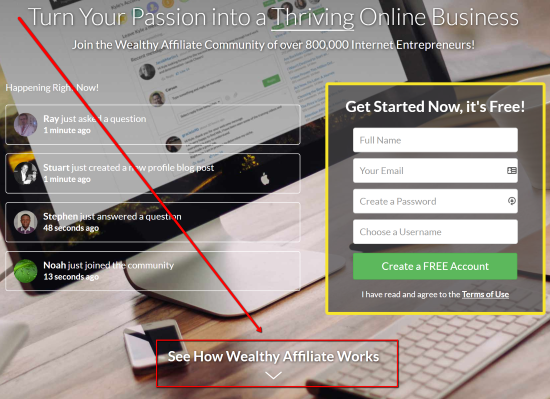 Wealthy Affiliate is a resource-based platform that provides everything you need to start an online business and earn passive income. This is a long-term approach to making money online as your business grows. For more information you can also check out my free step-by-step guide to making money online which you can get right now by clicking HERE. iVend - Like jobs such as Lyft, Uber, or mystery shopping... this one requires a vehicle. You’re not necessarily working “at” home, but “from” home. iVend is a small business not a job, so it will require investment. But, if you have the resources to get started it could be rewarding. Centre Holidays (home based travel agent) - Not exactly a job, but a potential opportunity (and potential loss). This a commission-based travel agent business that comes with a $995 start-up cost and a monthly fee of $95 - $155. Definitely not for everyone, but it's a potential work from home income stream for the right person. In the late 90’s and well into the 2000’s I spent many years doing B2B outside sales. Social media didn’t exist when I started, but as the web grew in popularity and companies like Facebook popped up, I often wondered how many professionals as well as small and medium sized businesses were aware of the benefits of being on social media and how to manage their presence online. As it turns out, not many. Even today, most don’t have time to bother. At least not effectively. If you have any knowledge or experience with social media marketing, you probably know more about it than 99% of the business owners you drive past every day. Print some flyers, business cards and start knocking on doors. Since you’re skilled at social media (or plan on getting skilled so you can make money at it), you will also learn how to locate local business owners and key employees online using tools like Google, Facebook and Linkedin… and promote your service. It might take some time but eventually you’ll land one client, then another. One place to focus is on professionals… doctors, dentists, lawyers etc who can benefit from a stronger online presence but don’t have the time or desire to do it themselves. Another place to look for home-based social media management jobs is on indeed.com and mediajobs.com. In much the same way you’d go about looking for Social Media clients (above), web design and search engine optimization (SEO) is another service that most professionals and small and medium businesses know little about. If you’re not skilled in these areas you can learn from training platforms like Wealthy Affiliate (mentioned above) who also provide training videos (Canadian based) about running yourself as a business, how to price your services etc. Teaching an instrument online is gaining in popularity, but there is still a strong market for it locally. Like the business ideas above, the best way to get started is to hit the pavement and knock on doors. I mentioned that I spent years in outside sales, going from business to business… and one thing I learned is that just about every office and business you go into there is someone who has kids at home, and they love to talk about them. Whether your expertise is with a guitar, a piano, tennis or yoga… many of those parents have talked about or thought of putting their children into lessons (or taking lessons themselves). Being in the right place at the right time will often be the incentive that gets them to take action. 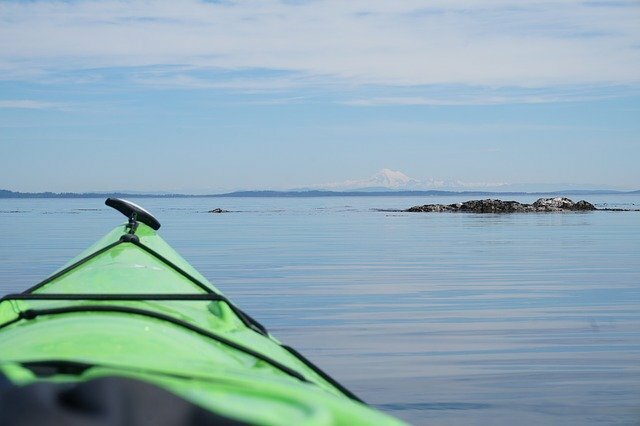 My wife and I have a friend on Vancouver Island who took a bookkeeping course and now runs her own bookkeeping business from home. Plenty of small independent business owners need someone to manage all of their invoices, receipts etc. There are also many firms who hire virtual accountants. No, you won't become rich doing online surveys... but there's probably no easier way to make a few extra bucks. Even if you tackle some of the other online jobs here, you'll more than likely be faced with downtime. Waiting on a transcription job, or driving Uber... you can guarantee you'll have some time to kill. And if you're going to kill time, you might as well make some money at it. Online surveys with sites like surveyjunkie.com are good way to make some extra money. You can also make money watching videos, searching the web and visiting websites with Swag Bucks. As Canadians we have a seemingly endless supply of work at home (or work out of your home) options. The biggest challenge (for most Canadians) however is that we've been brought up with an "employee" mindset rather than an "entrepreneurial" one. I get it, being an employee for a stable company (even if you're the boss) is arguably more simple, and seems less risky. But if you're reading this, there is something pulling you to become entrepreneurial and pave your own way. Hopefully this list of resources and suggestions sets you down that path. 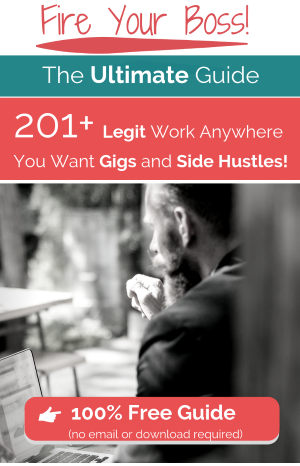 For even more work-at-home jobs and ideas check out my list of more than 200 here. Also... if you'd like to help others, please share (below in the comments section) any other work at home ideas or sources you have for Canadians. I want to also share this great company Virtatrade with you as another source of hustle incomes you can use to earn a good living incomes of over $100 daily from the comfort of your home without trading risk. Hi Kelvin, thanks for the suggestion. I definitely don’t endorse any form of trading or investment on my site though… but I do get asked about it sometimes. I don’t typically review investment sites but whenever someone asks me about a zero-risk opportunity when it comes to trading, I tell them to run. Sorry… just my opinion. Thanks for sharing though.